I have a wallet that says "nxt.json.aes" and I'm not exactly sure how to access what is in it. This site is asking for a google auth, which I don't have for nxt: https://wallet.mynxt.info/ (I have the password for the email address). The ".json.aes" file seems a downloaded backup from the myNXT wallet. This is an AES encrypted copy of the info for the account/s you had in your myNXT wallet at the time the backup was downloaded. 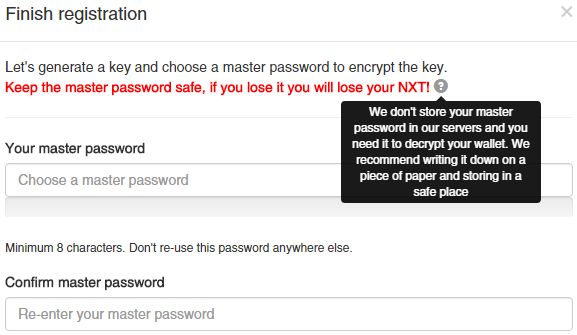 Unless you created additional Nxt accounts inside of your myNXT wallet since you obtained that backup, you wouldn't need to log back in because that file contains already your Nxt address and the passphrase for it. That's all you need to keep using your Nxt account with the official Nxt Client after myNXT closes. If you still need to log in to your myNXT wallet account, and you don't have the Google Auth code, please send an email from the address you registered with in myNXT to vanbreuk at gmail dot com, and we'll disable the Google Auth layer for your account. This master password was used to encrypt your wallet information in the myNXT database, so it was needed every time you sent a transaction from the myNXT wallet. It is also needed to decrypt that .json.aes file, and it was needed to download a wallet backup in the first place, so the fact you have a backup there means you did save the master password. Hopefully you can find it. It should answer any doubts. No it doesn't. I have no idea what that post is trying to say. I have a next ".aes" file. I have my email and password . Now that you have disabled my 2fa, when I put my email and password into this site: https://wallet.mynxt.info/ Nothing happens. Please don't be confused, I put my password and email in and hit login and nothing happens. The login button has a timer and the fields reset. I downloaded nothing called "wallet", but something called "client". There is no tab or button I can find called "security". Please explain with using words like "Mynxt" and "nxt client" i have no idea what you are referring to. Links are helpful etc. Ah i got it. tried a different browser etc ;P cheers! Sorry about that. The wallet site misbehaves with some versions of Chrome, but will work correcly in other browsers like Firefox, or under Chrome if using private browsing window.